Combining elements from both trading and strategy games, Commander: Conquest of the Americas will appeal to a wide range of players. Players take charge of one of the many European powers aiming to conquer the New World. Starting from 16th century, players can choose from many different nations, each with their own unique strengths and weaknesses. Founding new colonies and then making them thrive is key to success. In order to accomplish this, players need to manage and optimize resources and production in their colonies, before transporting the goods to other colonies or back to Europe. Rival powers and Native Americans can prove to be allies or enemies, depending on the player decisions. Hostile fleets engage each other in highly detailed tactical level. Players can command their ships in RTS fashion or take direct control themselves. Combining elements from both trading and strategy games, Commander: Conquest of the Americas will appeal to a wide range of players. Players take charge of one of the many European powers aiming to conquer the New World. Starting from 16th century, players can choose from many different nations, each with their own unique strengths and weaknesses. Founding new colonies and then making them thrive is key to success. In order to accomplish this, players need to manage and optimize resources and production in their colonies, before transporting the goods to other colonies or back to Europe. Rival powers and Native Americans can prove to be allies or enemies, depending on the player decisions. Hostile fleets engage each other in highly detailed tactical level. Players can command their ships in RTS fashion or take direct control themselves. 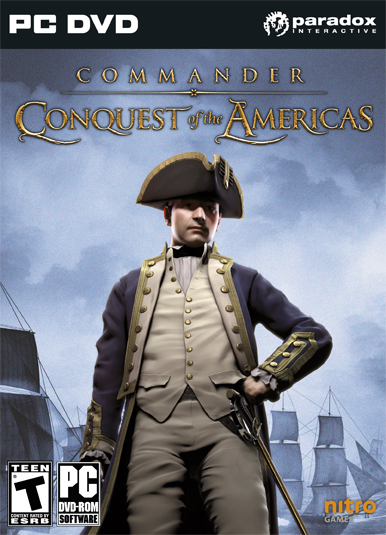 Enjoy Commander: Conquest of the Americas and many other great games on Desura. The 1.033 patch for Commander: Conquest of the Americas. The 1.03 patch for Commander: Conquest of the Americas. All names are historical from the late 15th, the 16th and 17th century. I like it. East India Company was also a good game, especially with Pirate Bay addon! A surgeon fails to properly close an open artery while finishing up his first surgery. The patient dies. That was your father on the operating table. You can't complain. You wouldn't have done better anyway. what if you where a surgeon, or in this case a game designer? I get what you mean i'm just saying there are holes in your context. Looks vaguely like the Total War series.